Jambo Everyone: Disney's Animal Kingdom News for October 26, 2016: Rivers of Light Coming Soon????? Disney's Animal Kingdom News for October 26, 2016: Rivers of Light Coming Soon????? Rivers of Light: Yes, I know you have heard this one before, but its very possible we will be getting news soon of the opening date for this show and it very well could be Thanksgiving weekend. We have been hearing that the show was released from Imagineering to Operations meaning that it is ready to go. The weekend before Turkey Day is the Destination D event on property which includes a special presentation by Joe Rohde on more details about the Pandora addition to the park as well as a history of the development of the park. Afterwards, there is a special in park gathering that at one point required theme park admission but now does not. This has led to speculation that this event will be the first showing of the Rivers of Light. Stay Tuned. 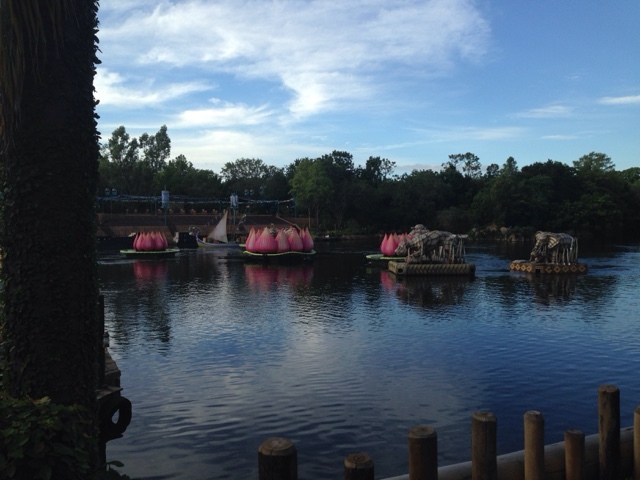 New Boat: Recently the Rivers of Light stage areas has seen a new "prop." One of the boats that will be used for the show is now parked for all to see. It is lined with all sorts of drums for use in the presentation. Another potential clue that we are very close to the actual show itself. Kali Refurb: Speaking of boats, Kali River Rapids is going down for its annual refurbishment. The attraction will be closed from Janury 3 until reopening on January 30th. This closure, although annual, is announced shortly after the tragic accident in Australia on a similar river rapids ride. Busch Gardens in Tampa has a similar attraction which they shut down until the cause of the incident is determined.